Boxers are one of America's favorite dog breeds? Read on for some fascinating facts about these one-of-a-kind dogs. Boxers have a long history beginning in Europe. Boxers first became popular in the U.S. in the 1930s and four dogs who were instrumental in siring American Boxers were known as the "Four Horsemen of Boxerdom." The dogs' names were Sigurd, Lustig, Utz, and Dorian. The progenitors of the Boxer breed are believed to have existed as early as the 16th century. 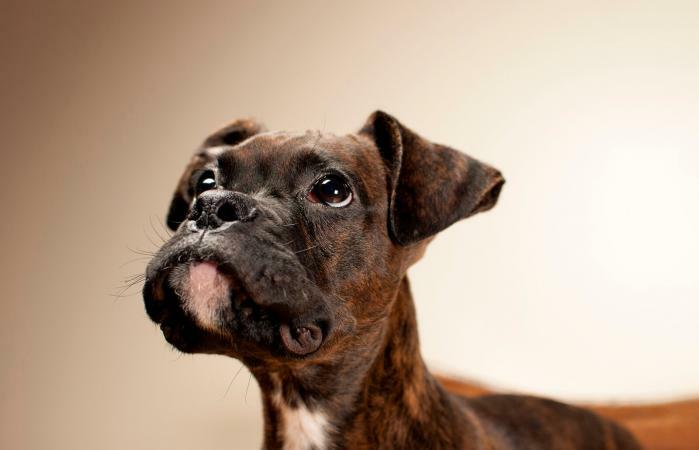 Boxers get their name from their habit of jumping up during play and pushing out with their front paws which looks like they are boxing with other dogs or humans. Boxer owners are familiar with the unique quirks of caring for this breed. Boxers have a lifespan of about 8 to 10 years. The oldest living Boxer was a dog named Maccabee who lived 16 years and 9 months. The Guinness Book of World Records awarded a Boxer named Brandy the designation of "Longest tongue on a dog ever." Her tongue measured 17 inches! Boxers are brachycephalic dogs which means they have a short, flat muzzle. This means they also are known for snoring. The dogs were purposely bred for their short snout in order to help them hold animals such as boars in their mouths. The position of their nose made it possible for them to breathe for long periods despite their mouth being full. Most people are familiar with the trimmed ears and docked tail appearance and don't realize Boxers are born with floppy ears and a long tail. Pabst, a Boxer mix, was named the world's ugliest dog in 2009. Did you know Boxers come in many color varieties and sizes? The most common colors for Boxers are fawn, red, brindle, fawn brindle and golden brindle with a black mask and white chest, lower legs and paws. Between 20 and 25% of Boxers are white which is not a color accepted by the AKC. Some white Boxers are born deaf in one or both ears. They also are more at risk from sunburn than Boxers of accepted breed standard colors. "Miniature Boxers" are a new designer breed that are not actually Boxers bred for a smaller size. They're actually mixes of Boxers and either Boston Terriers, Pugs, Rat Terriers or Fox Terriers. Boxers can fill a variety of roles in addition to all-around lovable family dog. Despite his silly and clownish nature, the Boxer is part of the working dog group because of his intelligence and usefulness as a guard, service and law enforcement dog. 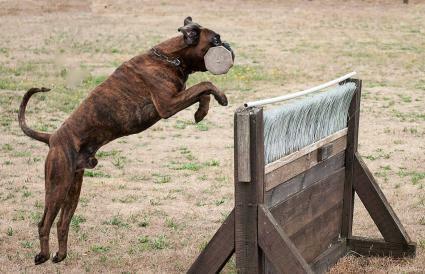 In fact, Boxers were among the first breeds used by police and the military as working dogs, starting in Germany. Not commonly thought of as a service dog, Boxers have actually been used as Seeing Eye dogs. They were chosen for people with allergies because they are considered hypoallergenic. Boxers were dedicated war dogs during World War II and assisted troops carrying messages and packs of supplies. The Boxer's rise in popularity in the U.S. was due in no small part by the love for the breed developed by American servicemen during the war. Boxers are more than just a well-known breed but a desirable one as well. For several years the Boxer has been one of the top ten dog breeds in the U.S. according to the American Kennel Club. Boxers are a favorite dog of celebrities due to their friendly, comical nature. Celebrity Boxer owners include actors Hugh Jackman and Ryan Reynolds, actresses Cameron Diaz and Jessica Biel, musician Justin Timberlake and reality TV star Kim Kardashian. They were also a favorite dog of classic film stars Humphrey Bogart and Lauren Bacall. While Boxers have been strangely under-represented in movies and television, a Boxer made a sensation in the United Kingdom in 2016 in a Christmas-themed television commercial. If you're looking for an energetic, fun-loving dog with a silly yet hard-working nature, this fascinating dog is a great choice for children and adults alike.